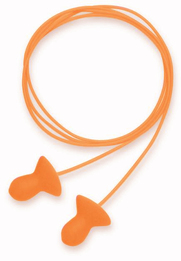 Howard Leight by Honeywell Quiet Corded Ear Plugs are also available without the sturdy carry case, or in an uncorded version. We also offer these Howard Leight by Honeywell Quiet Ear Plugs in a natural beige color, which is uncorded and average size only. Howard Leight by Honeywell Quiet Reusable Foam Ear Plugs Corded w/Case (NRR 26)5renyomDecember 7, 2013my father in law loves these corded post earplugs. Easy to insert with good sound cancelling.